Overview of Okitsumo paint｜オキツモ株式会社/Okitsumo Inc.
Okitsumo's heat resistant and other functional paints have different characteristics. It is necessary to understand them and follow instructions on how to use in order to fully bring out the functions that are best suited for its application and purpose. Paint consists of various types of raw materials that are roughly grouped into components that form the paint film and components that do not form it. 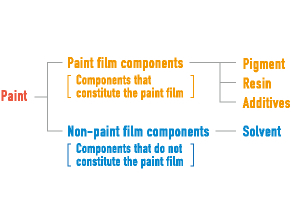 The components that form the paint film consist of resin, pigment, and additives; and the other components are solvent. With silicon resin as a key ingredient that excels in heat and weather resistance, using metal oxide for pigments will form the robust paint film with heat resistance. Silicon resin is the combination of organic groups, such as methyl and phenyl, and it has the Si-O-Si bone structure very similar to glass. 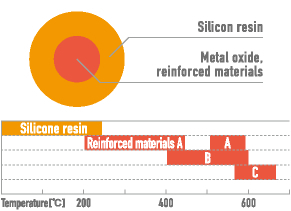 The silicon resin’s organic film is changed to hard inorganic film (similar to ceramics) at around 300°C. What is Heat Resistant Temperature? The heat resistant temperature of each paint is determined by the overall performance of adhesion, anticorrosion, and resistance to discoloration etc. In general, ordinary steel plates are used as materials to be painted. Recently, plated steels, aluminum, and stainless steel have often been used. However, the materials themselves have thermal limits. The above shows general heat resistant properties of each material. There are some products that cannot be applied on these materials. Please check applicable materials on each product's specification. Contaminations, such as oil, dust, and dirt, adhere to the material during the formation process. Before painting, the material must be cleaned by removing such adherents. Blasting A method that uses the rust removing device (blast machine) to blow river sand or silica sand onto the surface at a high pressure. Power tools A method used to scrape off the rust from the surface by using a sander or a grinder. Hand tools A method used to scrape off the rust by hand by using a wire brush or sandpaper. Degreasing A method used to remove oil by solvent cleaning and a degreasing agent. Removal of rust A method used to remove rust by using strong acid. This is also called pickling. Surface adjustment Adjusting the surface so that the chemical film forms equally on the surface. Chemical treatment Form a phosphoric acid zinc film to increase the corrosion resistance and adhesion. The surface treatment is one of the important processes that greatly affect the film life. Okitsumo's products can be treated in the same way as in a general painting work. It is also possible to do electrostatic coating as long as you are careful about the thinner's electrostatic property and dryness. Because some of products include large amounts of metal pigments, please mix thoroughly before application. 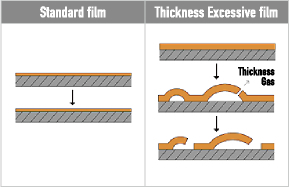 The film thickness is a very important factor because it determines whether the heat resistance, appearance, and anticorrosion can be maintained for a long period of time. The standard film thickness is very important because it brings out the highest performance of paint. The initial heating should be done gradually. When the standard film thickness is exceeded and heat-up is done rapidly, the residual solvent and the reactive gas are produced in large amount during the hardening of the paint film, which degrade the performance, such as peeling caused by the swelling of the paint film. Please select the appropriate paint according to the object's temperature conditions and the required functions. Or please feel free to contact us as we can select the appropriate paint according to the information that you give us, such as purpose, color, gloss, paint type, baking condition, heat resistant temperature, material, surface treatment, painting method, volume, and the required performance. Store the paint indoors in a well-ventilated place in accordance with the related laws and regulations. Do not use the paint where there is a possibility of fire. During painting and drying, make sure that the place is well ventilated and avoid inhaling steam or gas. If you have stored the paint for a long period of time, hard sediments appear in the paint even though the lid is completely sealed. Please mix thoroughly before use. If the paint container expands by any chance, please contact us. *The paints described in this document are designed and manufactured for general industry, and they shall not be used for medical/dental equipment and items or their parts that may contact living tissue or body fluid, regardless of whether it is temporally or permanently.